Multi-Purpose Pain Balm.An Ayurvedic Medicine.Fast Relief for Back, Neck, Joint, Head, Sprain.Iodex has been catering towards the muscular pain of Indians since a long time. 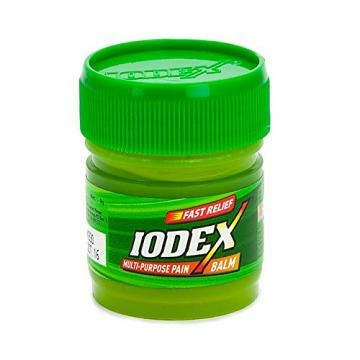 The new Iodex Fast Relief Balm is a typical balm deviced to provide you relief from joint pain, back pain and sprains. The balm contains oil extracts of Wintergreen, Turpine, Eucalyptus, Clove and Mint flower which are perfectly assembled to provide you instant relief from the excruciating pain. Ingredients: Gandapuro Tel (Wintergreen Oil) 4%, Turpine Ka Tel 800 Mg, Nilgiri Tel 800 Mg, Pudinah Ka Phool 600 Mg, Lavang Ka Tel 20 Mg, In An Ointment Base Q.S. Colour:Chlorophyll. Iodex head fast for Head ache reliefIodex pain balmIodex balmBenefitsIodex Double Power Rub has double the pain fighting ingredients that give quick relief from back pain, waist pain, joint pain, muscle strains and sprains. Buy Iodex Multi Purpose Pain Balm 45 G, sold & shipped by Desi Basket where you can shop online for Premier Online Indian Grocery Store Delivering Across USA. This Pain Balm collection has been tagged as Desi Basket, Health & Beauty, Iodex Multi Pupose Pain Balm Iodex Multi Pupose Pain Balm Health Beauty Iodex Multi Pupose Pain Balm Personal Care Iodex Multi Pupose Pain Balm Pain Relievers Iodex.